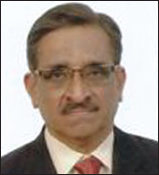 Dr. Purshotam P. Nainani is an alumnus of Nair Hospital Dental College, Mumbai, having obtained his B.D.S (1975) and M.D.S (1980) degree from the University of the Bombay. He subsequently set up his practice and has been a successful practitioner for more than four decades. The Indian Academy of Oral and Maxillofacial Pathologists was formed in 1992, and the First National Conference was held in 1993. The treasurer of this conference was Dr. Nainani and he managed the finances extremely so well that in the next couple of years, though there were annual elections for every post, the treasurer's portfolio remained with him since he had proved to the members that had successfully managed the task to him. Besides holding the post of treasurer for 20 years, he was also the secretary for 2 years and the past president of the academy. He had a flair for organizing a conference, so whenever the National Conferences were held in Mumbai, he along with his team gave a personal touch and made the conference memorable. Dr. Nainani was very much interested in academics; hence along with his busy schedule, he took up a teaching job and continued to work till his retirement this year. As a person, he was always cordial with his colleagues and struck a chord with all those who came in contact with him.